… and still they come in. Despite all the awareness-raising campaigns of the past year about the effects of micro plastics on the environment, I’m still receiving glittery cards, even from people I thought were ‘greenish’. 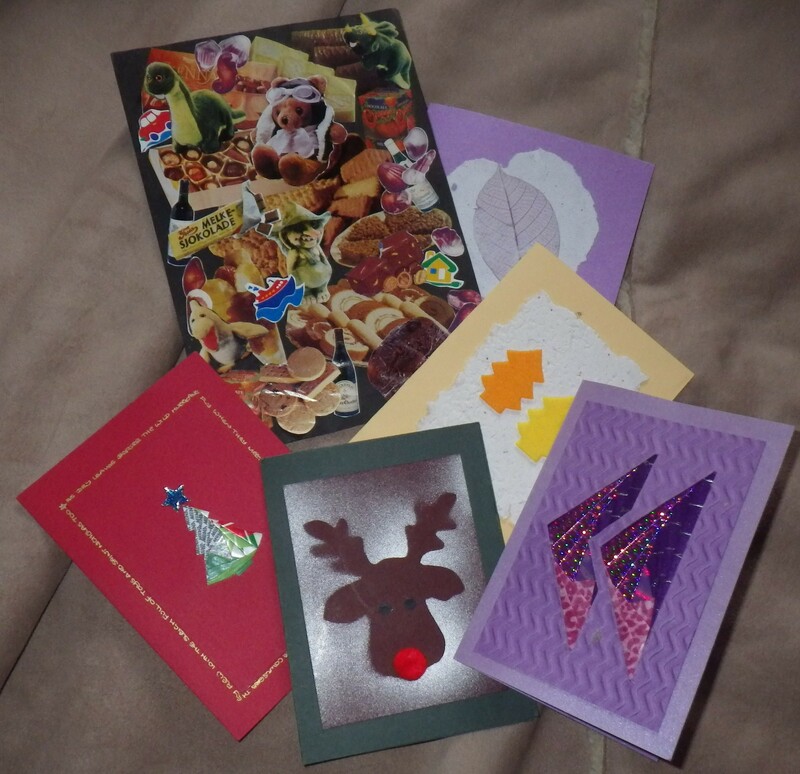 Mostly we’ve been glitter-free this year Chez Snail… one or two of you might recognise a card here! My favourite, i.e. most disappointing, example is a pretty Christmas tree card sold to raise money for a very worthy medical charity that boasts its environmentally friendly credentials on the back – ‘made from FSC sustainable resources, recycled materials and using vegetable printing inks’. But it’s sprinkled with glitter of which there is no mention. From opening the pretty card, that glitter is now on my clothes and my carpet so it will go with the clothes to the washing machine and with the hoover dust to the compost and so to the sea and soil. This card also reminds and requests me to recycle it. How am I to do this safely? Well rather than simply carp, I’ve decided to take inspiration from our Snail and take action; so every time I receive a glitter card I email a request to the producer for further information. I ask whether they are using ‘safe’ glitter. If they are request them to flag this up on their environmental credentials. If they are not, I ask them to change. And then add the big question how do they suggest I recycle their product. I add a link to a good, basic article on micro plastics: here. I’m still puzzling over whether to send copies of the correspondence to my ‘greenish’ friends – any thoughts? So far no replies from the manufacturers but watch this space. Many thanks to Patricia for writing this post on a subject that I hadn’t thought much about, but certainly is worth considering. If you would like to write a guest post on a subject that fits with the sort of thing that appears on The Snail of Happiness blog, do get in touch… I’m not making any promises, but it would be interesting to feature some things that you have been thinking about as well as my random musings.